In the computer networking world, there are two types of addressing schemes needed to get the communication done between two hosts. The first is physical addressing called MAC address and the other is logical addressing called IP address. Here in this article we are going to discuss the fundamentals of IPv4 addressing and routing. An IP address is a numeric identifier to each machine on an IP network to specify the location of a device on the network. IPv4 address is a software based address, unlike MAC address which is a physical address of a host. IPv4 address is a 32 bit binary numbering system and it’s mostly stored as a text file but displayed as a human understandable concept as a series of numbers, like 128.11.3.1 (a class B IPv4 address). IPv4 is a connectionless datagram protocol which means it is unreliable and works on a best-effort delivery service. Due to the huge growth of Internet, the IETF standardized a new 128 bit long version called IP v6 addressing scheme. Soon it will be the new addressing scheme used all over the world in the near future. Bit: A bit can have only a one-digit value, either 1 or 0. Byte & Octet: According to IEEE, A Byte is a set of adjacent bits operated on as a group. An octet is made up of a set of 8 bits, just an ordinary binary number. Network address: Network address gives network nodes a unique identity to communicate with each other. Broadcast address: This is the address used by applications and hosts to send the information to all nodes on a specific sub network. IP addressing contains two parts: Network ID and Host ID. Network ID is the network portion of an IP address. The Host addresses/Host ID is the portion of the address used to identify hosts on the network. 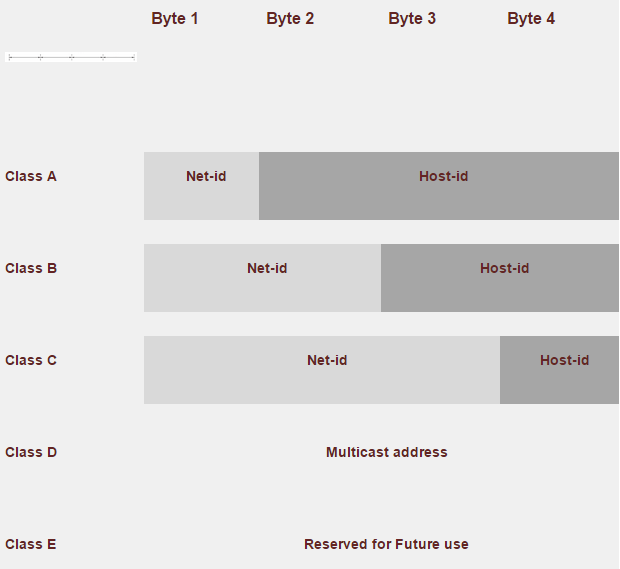 For a Class A network, the first 8 bits refers to the Network ID and other 24 bits is the Host ID. For a Class B network, the first two 2 octets is the Network ID and the next two octets the Host ID. In a Class C network, the first 3 octets is the Network ID and the last octet is the Host ID. The designers of the Internet created classes of networks based on network size. Class A is meant for a small network with a large number of hosts while Class C is meant for a large network with a small number of hosts. The diagram below, you can see that Class A network starts with 0: the first bit of the first octet will always be 0 and other 7 bits will change in the Network ID. For Class A network, the number of networks will be 126. 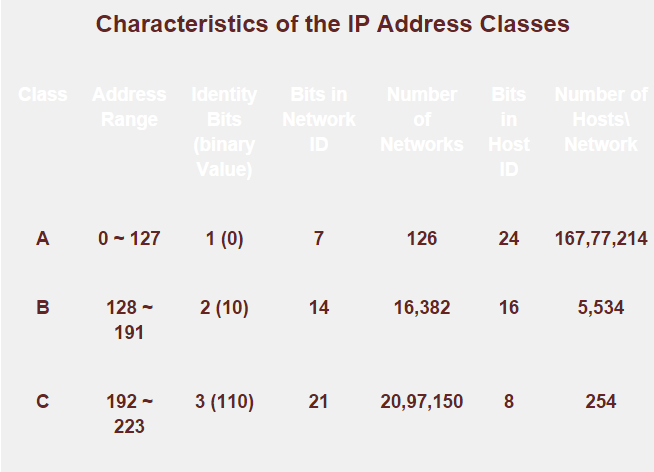 IP addresses with default CIDR values are considered as class full addresses whereas IP addresses with CIDR values other than the default are considered as Classless network. Ex: 192.168.1.0 /24 is a class full network while 192.168.1.0/25 is a classless network. A sub network/subnet is a logical division of a larger network into a smaller network. By using subnetting techniques, a network designer can reduce network traffic and manage the network better to enhance its performance.